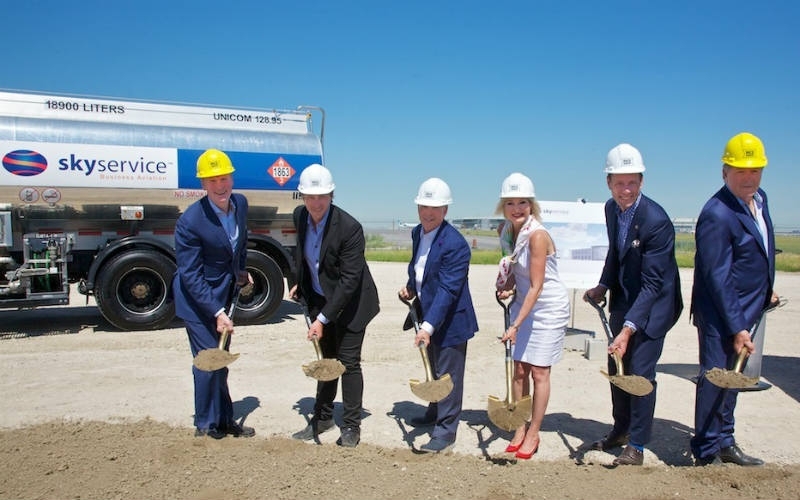 This week Skyservice, one of Canada’s leading providers of business aviation services, celebrated the ground breaking of a second full-service facility located at Toronto’s Pearson International Airport (CYYZ). The location of Skyservice’s new facility, scheduled to open in the spring of 2019, will be at the south end of the airport on Convair Drive. It will provide customers with a full-range of business aviation services including FBO (Fixed Based Operations), aircraft management, and maintenance services at Canada’s busiest airport. Skyservice explains this new energy-efficient and sustainably designed facility will feature a 100,000-square-foot hangar, as well as a 20,000-square-foot, full-service passenger lounge, including a modern business centre. With a presence in Canada for more than 30 years, Skyservice today holds four FBO locations in Toronto, Calgary, Montreal and Ottawa. The company provides aircraft management, charter, fbo, aircraft maintenance, aircraft sales and brokerage.